Home » Uncategorized » MERRY CHRISTMAS 2010! Summer 2007 I stumbled and fell with a heavy thud. When the global finance crisis struck the following year I was at my lowest ebb, and, therefore, most vulnerable indeed. Had I been a lesser man I should have cracked, I think. But then again when my conscience is clear, my strength and will to survive are insurmountable. For that I am eternally grateful. More grateful I am of the fact that I am blessed with such a vast and solid global network of people who love and care about me though; people who support and believe in me; people who, despite all my failings and at times self-induced personal calamities, are ever willing to fall and rise with me. Indeed, all-weather friends, Brothers & Sisters, family. My ever-loyal students, my clients and patients, as well as business associates have all in their own ways been great sources of strength and inspiration, as well as joy. I’ve heard many words of wisdom and hope here. My belief in the good of humanity is anchored in the compassion I continue to enjoy from all these people who so immensely contribute to making my world go round so smoothly. Year 2010 has been a most fulfilling year. Thanks to all above. 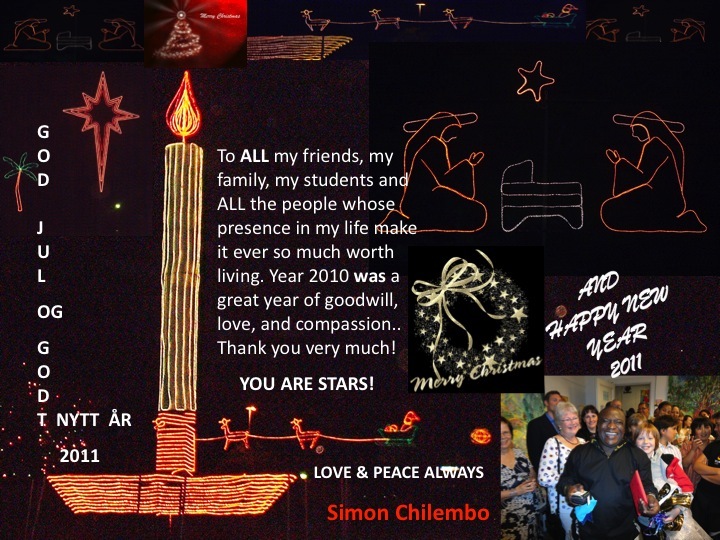 I shall enter year 2011 stronger than ever before; I shall live the year and beyond with greater passion than ever before, giving more of myself and my things as my way of saying “Thank you, ALL!” for the love, support, understanding, patience, generousity, kindness, faith, and care. It is, therefore, with the greatest love, joy, and pride that I wish everyone a very MERRY CHRISTMAS 2010, & HAPPY, PROSPEROUS NEW YEAR 2011!!! For those who are entrepreneurs, let’s all rock, let’s make the money and get wealthier; let’s change the world with opulence! By Simon Chilembo in Uncategorized on December 23, 2010 .